British Columbia is know for its dramatic scenery - the perfect combination of mountains, forests, and ocean! Whenever we are not shooting, we regularly head out on scouting trips, looking for new places that showcase the natural beauty of a location. While exploring the forests around Harrison Hotsprings in anticipation of a wedding at the Hotsprings Resort, we stumbled upon this abandoned grove of pistachio trees. 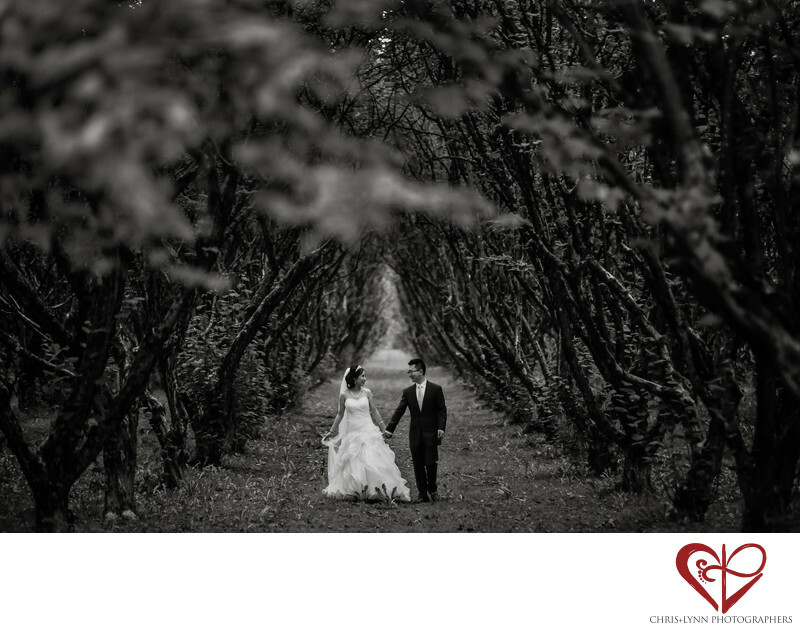 The lines of the trees combined with the large pathways through which the couple could walk, made it such an interesting location for photos. Luckily for us, one of our couple's main goals for their wedding was to capture unique images in unique locations! They had allocated two hours of time dedicated to portrait photography (yes!) and were excited to head out to this spot. Unconcerned about time or a a bit of dirt, the couple wandered in the grove enjoying the moment, and talking to each other about all their plans for the future. Location: Harrison Hot Springs, B.C., Canada.